Prepare yourself to be captivated by the spectacular environment that is the Tatras of Poland. You will be trekking out of the traditional village of Zakopane with it's beautiful sloping red roofs and horse and carts. Climb up on to the Szczerba mountain pass and through the Kondratowa valley with dolomite and limestone cliffs and caves surrounding you. 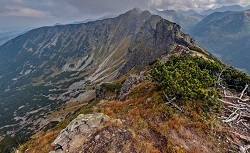 Upon reaching the summit of Weilki Giewont, that looks like a lying knight and is full of local folklore, you will then venture out to traverse the spectacular Polish/Slovakian border known as the Suche Czuby ridge line with one foot in either country. This two day trek will take you out of the ski resort of Zakopane to the local folklore peak of Weilki Giewont (1895m), and on through the Kondratowa valley for your overnight stay at Refuge Kalatowki (1200m). You will commence your 2nd day by ascending the steep Wdok Myslenickie Turnie ridgeline to gain the incredibly expansive view along the Suche Czuby ridge line that goes on for 37km seperating the border of Poland and Slovakia. The trek will predominantly walking along moderate technicality trails— although from time to time we may encounter some slightly more difficult scrambling sections to allow us to reach the higher ridges. We will then descend back pass the reguge to pick up you overnight bags and descend down the Bystra Gorge into Zakopane for well deserved celebrations. Day 1 – Fly to Kracow. Transfer (2hrs) to Zakopane. Day 3 – Refuge to Zakopane via Czuba ridge. Peak - Kasprowy Wierch. On the first and last nights we shall be using a simple hotel in Zakopane which is one of the main trekking and adventure activity centres in this part of Poland. You will have clean comfortable rooms with bed linen provided and washing facilities (most probably en-suite). In the mountains we shall be staying in a mountain refuge. You will be able to leave your ovnight bag whilst trekking on day 2 and then pick this up on descent down. Transfers to/from Kracow, 2 nights in clean, comfortable hotel or pension (B&B style) including breakfast, 1 night in a mountain refuge, first aid trained UK qualified mountain leader. International Airfares - please ask if you require assistance with flights and we should be able to offer well priced flights with good connections. Excludes transfers in UK to airport. Lunches and evening meals. 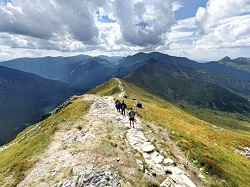 Summer daytime temperatures in Poland at sea level or at the bottom of the mountains can reach 30 degrees. Higher in the mountains temperatures will reduce. You should be prepared for both extreme heat and sunshine but also for cold and wet conditions.